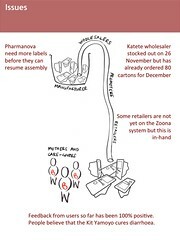 This week (29/11/12) we had our monthly implementation partners’ meeting, hosted by COTZ partner – Medical Stores Limited (MSL). My report to the meeting was a series of pictures using the syphon metaphor I’ve talk about previously which, incidentally, is proving to be a very accurate depiction in practice. This time yesterday, the whole flow of Kit Yamoyos was in danger of stalling because of a faulty printer and our inability to print the authentication and special offer labels – which meant we couldn’t assemble kits! However, we’ve managed to borrow a printer and print enough labels to assemble another 3,150 kits. This will take us through this month. We will, however, need a more robust system if we go to national roll-out. For those reading this in your email with images switched off, I summarise the numbers below, for those reading this on the blog with eyesight similar to mine – please click on the images to see them full size on Flickr. In summary, the figures are very encouraging despite the issues (slide 3) we have faced. 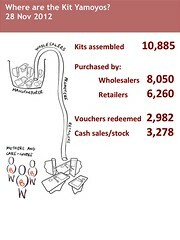 From a standing start and in the first 10 weeks of the project we have assembled 10,885 kits. 8,050 of these have been bought by wholesalers (note: bought, not given) and of these 6,260 have been bought by retailers. Why are retailers buying them? Wel,l because the 58 promoters we have recruited and trained are ‘promoting’ the product through community activities – such as community drama – and through the distribution of vouchers. Of the 6,260 kits bought by retailers, 2,982 have been exchanged for a voucher, and the remainder (3,278) have either been sold to mothers and care givers for cash or are still on retailers’ shelves. We don’t have precise data on cash sales at this point. However, I have visited many of our retailers and the impression I have is that they are not carrying a lot of stock and so we expect cash sales have been significant. Another observation from the field trips I’ve made (and I’m off on another one tomorrow) is that people who have used the kit are universally (so far) enthusiastic about it. If they hear you are in the community they come out and tell you about their experience. Everyone I’ve spoken to so far think the kit has ‘cured’ their child which, from a clinical point of view, is not strictly true. 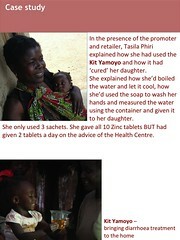 The kit stops the child dehydrating and replaces essential salts and micro-nutrients to enable the child to cure itself. But anyway, the key thing is that, so far, there is a very positive attitude towards the kit and mothers and care-givers feel they are doing the right thing by using it . . . which of course they are. 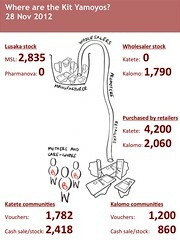 On the basis of these sales figures and on the advice of our private sector partners (Pharmanova and SABMiller) we think we will sell all 40,000 kits we plan to manufacture before the end of the trial. On this basis – and thanks to the support of Johnson & Johnson – we are going to order the packaging and components to assemble another 20,000 kits.